Have you considered having a destination wedding? They are much easier, more memorable & much cheaper to have! 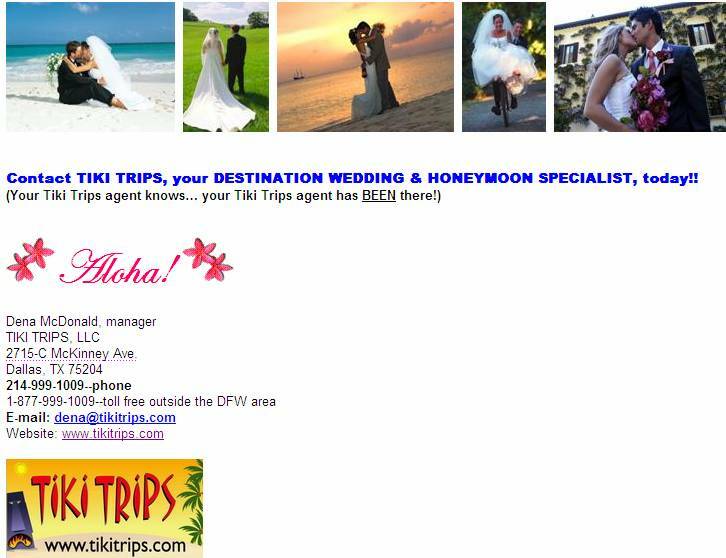 Your TIKI TRIPS agent has planned many, many destination weddings in exotic locations around the country & world. that everyone in your group has ever attended! 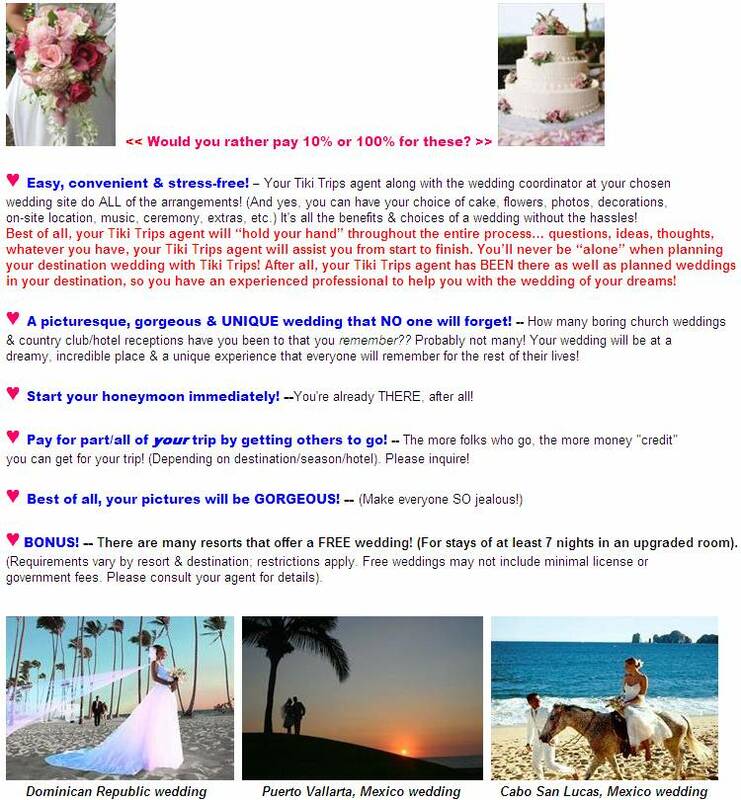 ♥ Pay 75% LESS to have your wedding in an exotic location than in your own hometown! wedding stuff here at "home" is expensive! area, a couple of photos, champagne for 2, recorded music, wedding coordinator, other small extras, all for up to 8 persons. flowers, bigger cake, other extras, hairstyling, manicures, etc.) Basic package may not include government fees or license. Wedding & resort inclusions & pricing vary by destination/resort & are subject to change without notice; restrictions may apply. Please contact Tiki Trips for more details on your destination/resort! PARADISUS~ MELIA~ COUPLES~ GRAND LIDO~ BREEZES~ PALACE~ SANDALS~ BEACHES~ EL DORADO~ more! 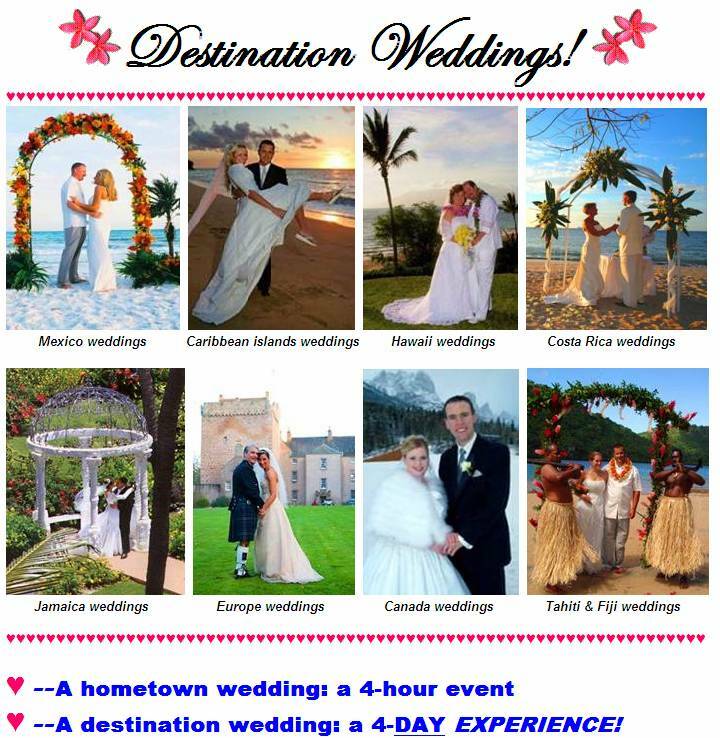 We SPECIALIZE in HONEYMOONS & DESTINATION WEDDINGS! *Free weddings have minimum requirements that must be met to qualify for a free wedding; restrictions apply. Wedding & resort inclusions are subject to change without notice; please consult your specific destination/resort for the most current information. All payments are non-refundable once made; please be certain of travel plans before payment. PASSPORTS ARE NOW REQUIRED FOR U.S. CITIZENS TRAVELING TO ANY INTERNATIONAL DESTINATION... get one soon! (Passports can be obtained through your local gov't tax office or main U.S. post office… please visit our website's main page at the bottom for more helpful info on obtaining a passport). Don't forget to re-confirm all flights with the airline 24 hrs prior to travel for any last-minute changes, & be sure to arrive at the airport 2 hrs before departure with proper identification. Happy travels!